The official English Mi PC Suite was released last week and many were unable to understand how it works despite having a short guide included in the thread. Here I am, writing a full and complete guide to using it, hopefully you folks can understand how it works after reading this. 1: Install after download. The file is available in the thread link (click here to download Mi PC Suite) given above. 2: At the main page, you can manage files, apps, photos, videos, notes, music, messages, contacts and most importantly phone backups, restore, system upgrade and ROM flashing. Screenshot and Screencast functions are also available. 3: After connection your phone, it automatically switches to use your PC's internet connection. Should you wish to turn it off, simply access your notifications shade on your phone and disable it. Do note that using the Screencast function turns it back on. 5: In the Backup interface, you can backup your phone's data and manage all previous backups. 6: In the Update interface, you can perform a system update and check the changelog of the update. Pick any option and let it run. It'll first download the fastboot ROM then flash it in. Note: This method only executes the flash_all script, meaning all data will be wiped from phone. After a successful flashing, it'll show another dialoge and your phone will then boot up. 8: You can manage all files on your phone and transfer data between your phone and PC with the File Explorer. 9: Check, unintall, restrict network access and install new applications on your phone using your PC, just by using the App tab. 10: Access the Photo tab to import or export and check your photos on your phone. 11: Similar to the Photo manager, the Video manager offers functions to import/export as well as watching the videos by double clicking on it. 12: The Music manager allows mass managing of music files as well as playing the files through your PC. 13: Messaging and Contacts allows users to manage messages and contacts on their phones besides the capability to send messages. 14: At the Notes tab, you can edit and manage your notes, change the colour tag, reminder, add in graphics and check lists. All will be synced with your phone. 15: If you encountered any problems or bugs while using the MI PC Suite, feel free to send some feedback. Here it is, the full and complete guide to all functions on the Mi PC Suite! I hope you guys can understand and use it better now. Thanks for reading! my mi4 deviCE cannot be detected..any solution? I have just got latest update of MIUI 8.1.1.0 For Redmi Note 3 (SD Version) . 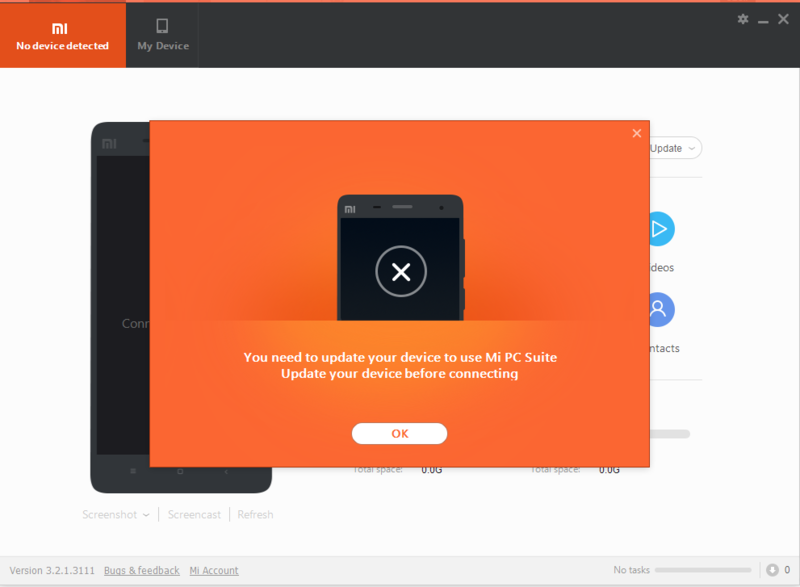 After updating my device Mi PC Suite didn't working now. I m using WIN 7 Ultimate. Please Tell me What to do ??? Supported computer system: Windows XP, Windows 7, Windows 8/8.1 << Please, supported for linux too..
unofficial miui V6 phones will not support this pc suit ? your phone needs to be updated error message ....! people are really less discriminating these days. no wonder after downloading the application, installing in Windows and running it, they are in for a surprise.. this application circa March 2015 is already stale, old and no good. while it still runs in Windows 10, it does not support anymore any mi device running Android 6, 7, and etc. that is why the application says it cannot find the mi device. this problem should have alerted mi developers to update this so that new devices with Android os beyond 5 should be supported. paging moderators. please lock this thread and release only if and when an updated PC suite is compiled. Cheers for the helpful info!! Hi, just asking , does secure to connect to the pc all of time? Especially to the battery, Because when we connect phone to computer always charge. Don't PM me about technical issue! !